Sky challenges Amazon and Google with Now TV Smart Stick | What Hi-Fi? The £15 streaming stick comes with a voice remote, introduces offline viewing, and goes on sale in February. USB-key-sized devices that plug into your TV to gift it thousands of hours of on-demand TV and film content – it’s little wonder streaming sticks are so popular. That popularity has stemmed from the existence of the Amazon Fire Stick, Google's Chromecast, Chromecast Ultra and Roku's Streaming Stick+, and today Sky has announced it’s joining the plug-in party with the Now TV Smart Stick. And at only £15, it has the potential to be a streaming option of serious value. Arguably it’s been a long time coming, what with Sky’s Now TV box currently in its third iteration. Like the box, the stick is powered by Roku, and grants access to Sky content and UK catch-up services (such as BBC iPlayer, ITV Hub and All 4), as well as over 50 apps including YouTube and, unsurprisingly, the Sky Store. The stick also lets users pause live TV on Now TV’s premium channels, which include Sky Sports, Sky Atlantic and Comedy Central. What’s new for the stick is offline viewing. Users can download content into their smartphones from a kids pass from “this spring”, with entertainment and cinema passes following. By the end of the year, both live and on-demand Now TV streams – from the likes of Sky Atlantic, Sky One and Sky Sports – will also be available in Full HD, too. As with Sky’s Soundbox and Sky Q set-top box, the Now TV Smart Stick comes with a remote featuring voice search functionality, allowing users to find specific content simply by saying its name, or that of the directors and actors, into the remote. The elephant in the room: no 4K or HDR support – which is perhaps surprising considering Sky is one of the few TV providers broadcasting in Ultra HD. Perhaps another box or stick announcement is coming. Or maybe Sky wants to keep 4K content exclusive to its TV customers. Those wanting a streaming device for Netfix or Amazon’s 4K content have a choice between the Roku Streaming Stick+ and Google Chromecast Ultra, or Amazon Fire 4K TV or Apple TV 4K boxes. 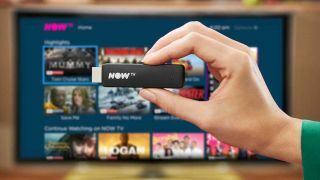 The Now TV Smart Stick will go on sale in March for £15, or £20 with a two-month Entertainment pass or one-month Sky Cinema pass, or £30 with a one-month Sky Sports pass. Sky and BT to share TV channels from "early 2019"